Easter festivities may present unique menu challenges to the home cook. I’m not referring to the celebratory menu, per se; traditional Easter dinner recipes are often engraved in stone, as they very well should be. It could be considered passive-aggressive to replace your mother-in-law’s beloved Maraschino Cherry Glazed Ham with a roast leg of lamb; downright heresy substituting the Sweet Potato-Marshmallow Casserole with Roasted Asparagus and Goat Cheese. The challenge I’m referring to is what to feed your family prior to the egg hunt, Easter bonnet parade, or church service — heaven forbid your stomach growls during a sermon of resurrection. Or perhaps you’ve house guests arriving for the holiday weekend and would like an idea on what to make for a simple Saturday brunch. This was my question as I plotted the holiday weekend. My daughter and her boyfriend are coming to town, and I don’t want to be fussing with recipes instead of enjoying their company. I need a no-hassle, breakfast/lunch dish that can be made the afternoon before the morning I plan to serve. I yearn for retro-food on Easter to conjure memories of holidays long gone by. Retro often implies tasteless, but it can also imply soulful and yummy — a dish that opens a shuttered memory, such as Grandmother’s Deviled Eggs or Mom’s Lemon Meringue Pie. So what to make? Best consult my friend, retro-Dot. Unlike myself — always seeking out a new recipe to test and write about — Dot Cattell has a series of tried and true reicpes that have been in her family for decades. I sometimes keep her company as she drives her weekly route for Meals on Wheels. When not figuring out which house gets what setup, our conversation turns to recipes. Dot’s a prolific hostess, and her house is often filled with family, extended family and out-of-town guests. I remember her making a well-received egg and sausage strata for a brunch and I was sure this dish would suit my needs to a T. I asked if she would share her strata recipe — she didn’t have a clue as to what I was talking about. 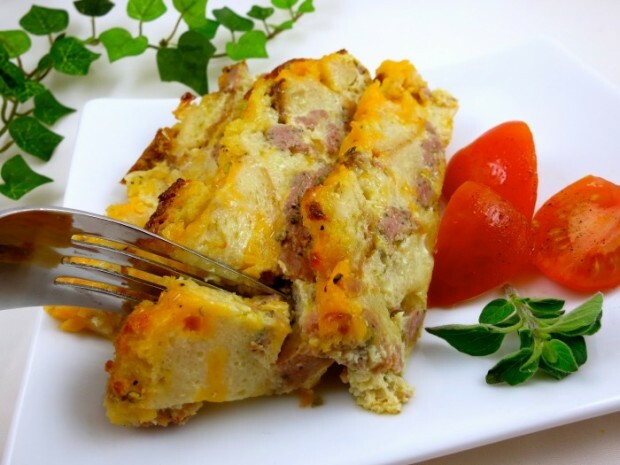 After I described the light yet toothsome dish of savory sausage, bread and cheese, she replied …”oh yeah, the breakfast casserole.” “Strata” — which is a layered bread, egg and cheese dish often incorporating meats and/or vegetables — is not a retro word. 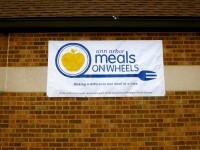 Dot then proceeded to pull out her Meals on Wheels wicker basket, load it with food, and make her first delivery. I spoke with Rhonda Rogowski, the volunteer coordinator, who tells me every day the operation provides 200 hot meals that have been prepared in the University of Michigan kitchen. Rhonda tells me she is actively recruiting new volunteer drivers who critically keep the wheels moving forward. Hours are flexible, according to the volunteer’s availability; one may volunteer weekly, monthly, or bi-monthly and have the choice of days. You may also volunteer as an on-call substitute when permanent drivers have conflicting plans. Dot has been driving various routes for years, and appreciates the fine-tuning behind behind the stream-lined operation — her time is never wasted. Back to the recipe. Dot advises selecting your sausage with care; it injects much flavor into the final dish. She uses pork sausage that’s been seasoned with sage. But I’d imagine a Southwest or Italian spiced sausage would also be fine. I, in fact, used a turkey sausage seasoned with fennel and garlic purchased from Whole Foods.The internet is rife with variations on strata, which may incorporate any cheese under the sun or spinach, sun-dried tomatoes, mushrooms, caramelized onion, potatoes, tomatoes, squash, or asparagus.Brie’s a sweet treat with brown sugar and pear. Whole grain bread or tangy sour dough may, as well, be substituted for the challah. You won’t find Dot, however, deviating from the recipe below, which would be considered an act of family treason. Follow with a fruit salad — don’t forget to include grapefruit and oranges, so sweet at this time of the year. Over medium heat, brown sausage in a heavy-bottomed saute pan; drain fat and reserve. Beat eggs with 1 teaspoon kosher salt and pepper*, and dry mustard or Dijon; whisk in milk or half-and-half. Stir in bread, cheese and browned sausage. Bake, uncovered, 35-45 minutes, or until golden brown. Let sit 5-10 minutes then serve hot garnished with quartered Campari tomatoes, if desired. *If sausage used has enough sodium &/or pepper, you should omit.